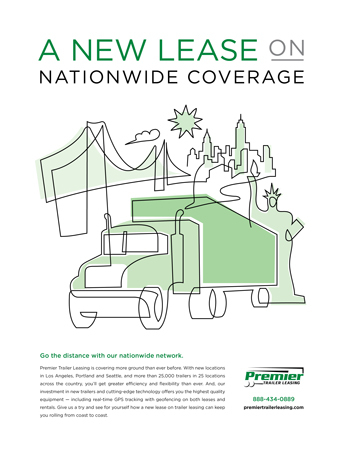 CLIENT: Premier Trailer Leasing is a full-service provider of rental and lease trailers to the shipping and trucking community. CHALLENGE: With a recent $200 million investment in equipment and technology as well as the acquisition of several smaller companies, Premier had quickly grown to become one of two national players in the industry. To capitalize on this growth, Premier wanted to increase its brand awareness, inform the target audience about their recent expansion nationwide, promote their expanded and updated services, and distinguish themselves from the competition. 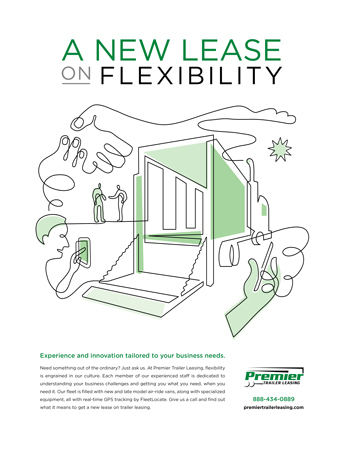 SOLUTION: Three key messages were identified for the campaign: Premier is a strong, growing leader that now has a NATIONWIDE footprint; Premier’s innovative TECHNOLOGY helps clients control costs and increase efficiency; and Premier is FLEXIBLE and offers custom solutions. 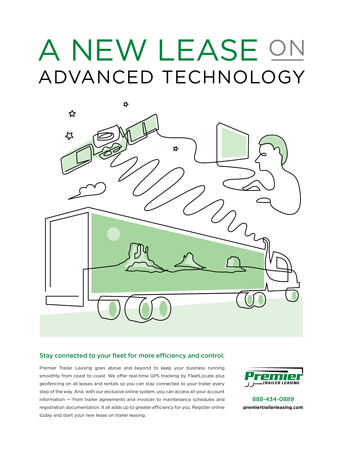 The tagline: “A NEW LEASE ON…” was employed to reinforce that Premier had reinvented itself and now offers a better solution than competitors. A series of print ads ran in a key trade publication, designed to stand out from the competition by having a unique illustrative style, rather than the typical truck/trailer photo most competing ads contained. Subsequently, trade show and promotional items were developed, the website was updated with the new graphics, and an overview brochure was created. Both outbound and inbound sales leads increased when the campaign launched, including a 233% increase in online leads. This led to an unprecedented 154% increase in total revenue (Q4 2014 vs Q4 2013), led by a 174% increase in lucrative long-term leases.